The eyes seem vacant most of the time. So does the face — expressionless, void of anything. Aaron Nola likes it that way. It keeps hitters guessing, just like his two-seam fastball, curveball, four-seam fastball and changeup do. 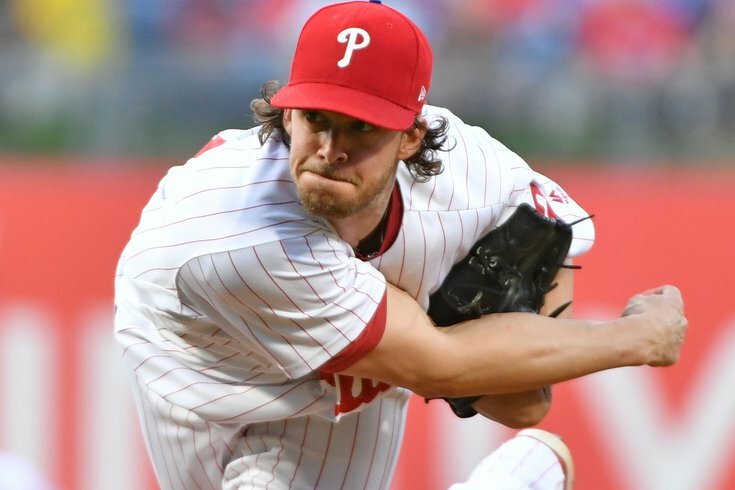 Nola’s progressing maturity — and the command of those pitches, especially the changeup — made the San Francisco Giants guess wrong 26 times, leaving them swinging at air all night in the Phillies’ 4-2 win on Tuesday. Nola struck out a career-high 12 batters, driving his record to 5-1, which places the former LSU star into a third-place tie among all major league pitchers with Houston’s Lance McCullers Jr. and the New York Yankees’ Luis Severino, behind only Washington’s Max Scherzer (6-0) and Boston’s Rick Porcello (5-0). More importantly, Nola is developing into one of the best pitchers in baseball — a true No. 1 starter, a tag many believed was dubious when the Phillies selected him with the seventh-overall pick in the 2014 MLB Draft. ESPN currently has Nola as the third favorite to win the National League Cy Young award, behind Scherzer and Arizona’s Patrick Corbin (4-0, 2.15 ERA). The 26 swinging strikes Nola induced again the Giants (another career best, previously 18) are second in MLB behind only Seattle’s James Paxton* (31, in the Mariners’ 3-2 loss to Oakland on May 2). *Paxton threw a no-hitter in his next start. Nine of Nola’s 26 swinging strikes were produced by the changeup, a pitch he’s been honing the last few years. The young righty has been always classified far more as a pitcher than “a thrower.” Against San Francisco, he used his fastball, which was clocked at around 94 mph, early to set up his changeup – when Giants’ hitters were looking for the curveball. Nola still threw his curveball, sometimes when down in the count, and that left San Francisco hitters out in front and baffled by almost anything 24 year old tossed up. In the process, Nola dropped his ERA from 2.17 to 2.05. “We saw tonight what the combination of poise and stuff equals,” Phils’ skipper Gabe Kapler said about Nola, who continues to make his new manager’s life much easier. “We saw a calm, cool confidence, plus, three pitches that you can command and two that are playing up in a special way in the curveball and the changeup. ‘Noles’ continues to flash that 94 [mph fastball] early in the game and I think that makes the opposition respect the fastball. They have to be aware of it. Nola threw a season-high 109 pitches, 75 for strikes, over seven innings. He got the heart of the Giants’ order – Andrew McCutchen, Buster Posey, Brandon Belt and Evan Longoria – to strike out a combined seven times. “When you’re throwing names out there like McCutchen, Posey, Belt and Longoria, you know that you’re in for it,” Kapler said. “I went through their lineup prior to tonight’s game, and really their careers, and these are All-Stars and borderline Hall of Famers that they’re running out there. Last season, the Phillies were 14-21 after 35 games and were 9 games out of first. This year, they’re 20-15, and are .5 behind an Atlanta Braves team that appears to have some staying power. Furthermore, they didn’t reach the 20-win mark until June 5 of 2017, when they were 20-35, sitting in last place, 15.5 games out of first. This year, it took nearly a month less – and 20 fewer losses – to get to their 20th win.